John has gone! We went to the airport at 5.45am – he drove there and then I had to drive back. Problems started as soon as I got to the car park exit. You have to pay £2.- to drop someone off. I had my two coins ready and dropped them into the chute. Nothing happened – the barrier did not lift up. What to do? No man in attendance and a queue of cars rapidly building behind me. I had a credit card with me and so decided to try to use that. There was a piece of paper in the slot and so I pulled it out. Hey presto! I heard my coins drop into the machine and the barrier lifted. Someone must have left their receipt in the slot and so the machine would not accept a new customer until I had removed the piece of paper. By this time I am flustered and so took the scenic route home. There was very little traffic and it was OK. Steve has said he will collect John on Saturday and so my worries are over. However, I have applied to have two confidence boosting driving lessons. The AA do this for free if they think you are a suitable candidate. I have filled the form in and am waiting to hear. I can see that my Rowan FIne Art Sock Yarn has been packed in Germany as it says Completed alongside the items and then it says Order in Progress which means it is being despatched. I should have it this week. Now I must walk Slip before the postman arrives, Back tomorrow. Just a quickie as I am busy packing for John…..last minute ironing, finding his passport etc. 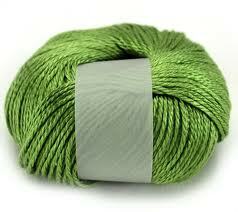 I have some Kidsilk Creation in Smoke and Jelly at $10 a skein……not much though. Jackson has been gone since 10pm last night……I would buy one of the cat cameras that fit on the collar but he loses his collars so often and the camera is quite expensive. Jackson has a new outdoor bed! 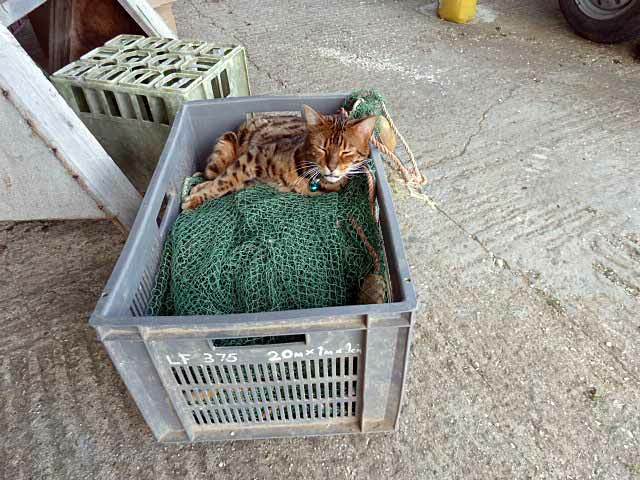 He has taken up residence in a crate that holds a smelly net that John uses when they net the river for pike.He stayed in last night until 5am when he woke me up and I let him out. We went to Browns last night. I had asparagus and parma ham with hollandaise sauce to start and John had a roquefort and chicory salad with hazelnuts and raspberry dressing. Then I had half a lobster with french fries and John had an Iberico pig steak with salsa and apples. I had one Grey Goose Le Fizz ( vodka, sparkling wine and elderflower cordial, one Marzipan Bellini and one Vanilla Daiquiri – all delicious! I have made a very hot curry for lunch and made meringues which I shall fill with hazelnut spread and cream. Now I must cook the poppadums! Back tomorrow! Jackson is still staying out for long periods – 12 hours plus – but I am no longer worried about him. He turns up like the proverbial bad penny. Tonight we are going to Browns in Cambridge. Lots of cocktails available! I think I shall try something different and not have my usual Margaritas. I quite fancy the Marzipan Bellini. John is getting ready for Ireland. His flight is at 7.30 am on Tuesday and so we shall have to be at the airport by 6.15 at the latest. Then I have the horrid drive back. I shall do the de-tour through the countryside so that I do not have to face the gigantic roundabout. Maureen, Kessa, Jacki, Joan, Theresa, Janet and Anne all gave the correct answer to the currency question – Mexican Pesos. Now this question is a bit harder. All the words in the list below have something in common and it is to do with meaning – what is the common factor? Answers to jannette@easynet.co.uk with Meaning as subject by midnight Tuesday please. Now I must give Slip her dinner – she is pestering and nudging my legs! Back tomorrow. Jackson has been gone since 9.30 last night – I am getting used to this absent cat. I just wish I knew where he goes for such a long time. I am getting it at a good price – also some Cashmere. John and Slip went to Grafham Water fishing but soon came back as it was too bright. I have ordered lots of things to arrive next week whilst John is away – I hope he does not decide not to go because it is too hot / wet / windy / cold! I am making Spaghetti Bolognese with red wine and anchovies for dinner tonight. We love anchovies and so does Slip! But she loves everything! Back tomorrow. Jackson has vanished again! No sign of him since last night. I have given up worrying! But it is a mystery as to where he goes. INCOME TAXES, change the T to another consonant and rearrange, and you can get the two-word name of a foreign unit of currency. Answers to jannette@easynet.co.uk with currency as subject by midnight Friday please. It is hot here today. We have been over the river trying to net a pike that has been eating the trout. Well, Kevin and John actually did the netting – I merely observed. They did not catch it! I have more Superior on the way to me and the Rowan FIne Art book should come any day. Going to make a prawn cocktail now! Back tomorrow. Jackson is back…..and gone again! He appeared at the patio door, I let him in and he was hungry. Five minutes later he was trying to open the patio door with his paw…..he cannot open it. So I did…and he has gone again. Maybe he has a lady friend?! He is naughty to worry me!